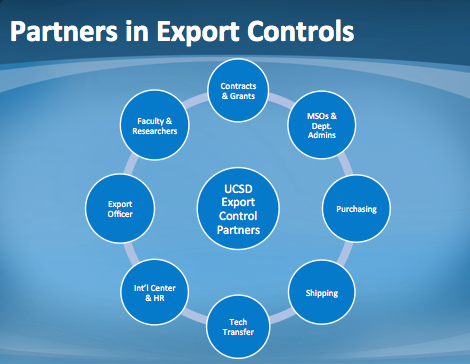 Learn about the UC San Diego Export Control team and services. Export Control identifies and manages export risks and provides export licenses in support of the research activities of university faculty, staff, and students. Brittany Whiting is the Export Control Officer and serves as the campus leader and resource for designing, developing, and implementing an export control education, licensing, and compliance program. The Export Control Officer's primary responsibility is to provide support and expertise in international trade areas. She has held positions in higher education at UC Santa Cruz, and in industry with Quantum 3D in San Jose and, most recently, with Advanced Micro Devices (AMD) in Austin. Having worked in more than 25 countries with leading international companies and organizations, Ms. Whiting is a recognized international trade consultant and trainer and has served as director for the Silicon Valley Center for International Trade Development and as a contractor for organizations such as the United Nations Environment Programme and the U.S. Agency for International Development. Ms. Whiting received her Bachelor’s Degree in International Affairs and Latin American Studies at George Washington University and holds a Master’s Degree in International Commerce and Policy from George Mason University. Garrett Eaton is the Facility Security Officer (FSO) and Senior Export Analyst for the campus. He manages and oversees the operation of the National Industrial Security Program at the Marine Physical Laboratory (MPL) and UCSD, ensuring compliance with Federal regulations and University policies and practices. He also supports UCSD’s Export Control Officer, Brittany Whiting, providing an extended knowledge base and resource for campus compliance with export regulations. MPL was founded by basic and applied researchers conducting important, ground-breaking underwater acoustics research in support of WWII. MPL researchers continue this legacy today with cutting-edge oceanographic research in support of the defense community. After 10 years at MPL, Garrett gained an exceptional understanding of the procedures and regulations that enable this type of research to take place within the academic setting. 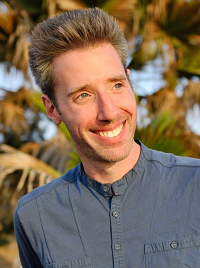 Garrett received his Bachelor’s Degree in Literature and Composition at Arizona State University. Ryan Jordan supports UCSD’s Export Control Officer, Brittany Whiting, providing an extended knowledge base and resource for campus compliance with export regulations. For more information, email Export Control or call (858) 246-3300.